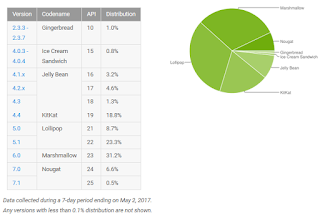 Every month, Google releases its distribution numbers which show the percentage of each Android version that is actively being used during the month. This helps developers gauge which Android Version it should aim to develop an app for to ensure the widest compatibility. Currently, Lollipop remains at the top with a total of 32% share and just behind is Marshmallow at 31.2% which, actually, hasn’t budged since last month's numbers were generated. 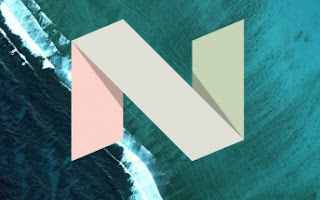 Otherwise, Nougat’s distribution numbers are steadily rising up: 7.1 percent from April’s 4.9%. The wave of Samsung Galaxy S8 devices that are still being activated on a daily basis is thanks, in part, to the spike of the Nougat share. Otherwise, Gingerbread, Ice cream sandwich, and Jelly bean have all dropped a little in share, which is good and means folks are upgrading to newer devices. KitKat lost the most share, dropping 1.2 percentage points down to 18.8% from last month’s 20%.